Info "Ah, bell ringing, one of life’s simplest pleasures." Bell Captain is one of Dribble and Spitz's Microgames in WarioWare: Smooth Moves. The player has to swing the hammer (a suspended beam in the Japanese version) forward at the right time to strike the bonshō. 1st level difficulty: The bell doesn't move. 2nd level difficulty: The bell sways left and right. 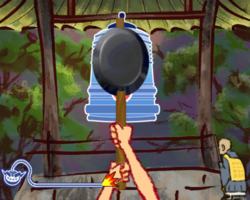 3rd level difficulty: The bell falls down from the top of the screen. This page was last edited on April 17, 2018, at 15:39.